Real Grass Vs. Fake Turf: Which is Truly Greener? Sometimes it’s easy to choose the greenest way forward. This is one of those other times. Artificial grass: once a novelty affordable only by the wealthiest sports-grounds, it’s now set to conquer the domestic markets as a green product. But which grass is greener – the real thing or the Brady Bunch stuff? Fake: Better than the real thing! Near-Zero Maintenance. Save reservoirs of water (can’t get greener than that), doesn’t get churned up into ugly bald patches, and has a longer “life” than grass. It doesn’t matter how eco-friendly your mower is – ditch it. Gets rid of unwanted plastics. You’re standing on recycled tires. (And no, if it catches fire it won’t burn for a decade). Hygiene-Friendly. SynLawn recently released a version that’s porous and anti-bacteriological – music to the ears of pet-owners. Extra chemicals? An estimated 70 million pounds of pesticides and fertilizer dousing U.S. lawns every year? Not on this. Is that a gasoline-powered mower I see in your garage? Oh dear – and you call yourself green. Real: Nature got it right the first time! 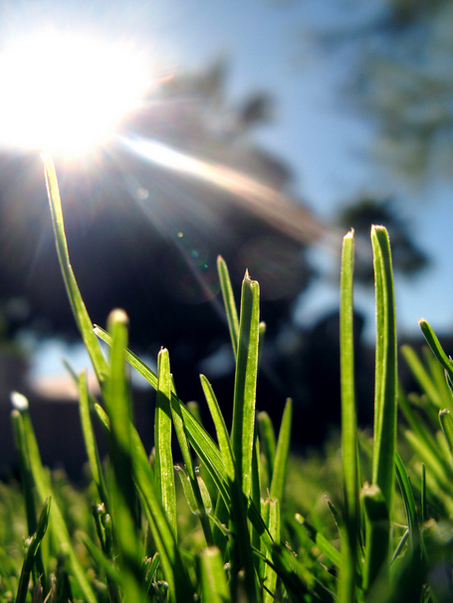 Lawns just don’t help the environment – they are the environment (pdf). Cleaning the air, sustaining microbial life, providing worms for birds, and so on. Take lawns away, and our suburban ecology falls apart. It’s your garden – it’s meant to be tended. That’s how you develop a relationship with it, one where you both grow. It’s a living thing, not an inanimate appliance. (You work in I.T., right?). When the sun’s out, plastic turf heats up something rotten – up to 160 degrees Fahrenheit, some say. Even if that insufficient to actually melt a plastic tire, surely the fumes will be toxic enough. Lawns are carbon sinks: admittedly this is offset by their maintenance, but even so, the 40 million acres of American lawns filter in the region of 13 million pounds of carbon dioxide annually (estimates Brendan Koerner for Slate). Difficult to know where to stand, isn’t it? Sara’s shameless plug: Hi, it’s your editor. De-lurk, dear reader, and leave this fabulous writer a comment. (We love chatting.) You can also share this post with friends – just click your favorite social bookmark listed below. New reader? Be sure to sign up for the weekly newsletter to win free eco goodies! You can also subscribe to any RSS feed your heart desires.